Leading the dull loser lives that we are, I wouldn't mind dying in epic style with millions of earthlings for company - watching open-mouthed as a 1500-foot giant tsunami rolls magnificently over, watch a whole island turn into a mammoth volcano all around me or fall into those deep cracks caused due to a mega earthquake, screaming like hell as I disappear. 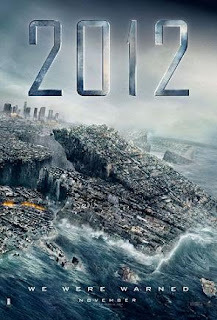 Nobody dies the usual way in the latest Hollywood disaster movie 2012. Predictably, the lead characters survive to save the day. So it is left to the special effects team (hail the VFX people!) to make it all fun and convincing, even as cities fall apart and world-famous monuments are reduced to rubble. The loud soundtrack does the rest. Don't look for a story, expect emotional pep talk on universal brotherhood and have fun. 2012 is a movie to be enjoyed and forgotten, on the 70mm screen.